Home design continues to evolve but one element remains true: The bathroom is often the oasis within the home. A secluded bathroom is an ideal spot to experiment with modern designs without undergoing a major renovation. Below are a few tips on how to incorporate contemporary elements into an existing bath. Choose simple and polished accessories that complement the aesthetic of the room. Incorporate sleek, angular towel bars or an elegant robe hook to create a clean layout that is functional and design forward. Incorporating modest touches that fit your personal style, such as striking rose quartz crystals on your shelves, will transform the space into a serene oasis. A modern look doesn't need to be synonymous with sharp lines and monochromatic colors. Incorporating softer materials such as a plush rug, textured bath towels or handwoven wicker baskets will provide contrast to angular accents, bringing a sense of warmth and tranquility to the room. Ensure your space remains modern for years to come by installing timeless fixtures. Inspired by the modern styles found throughout European homes, the Delta Emerge Shower Column couples bold lines with impactful design to deliver a luxurious, customizable shower experience. Simply mount it to the existing shower wall and plumbing. 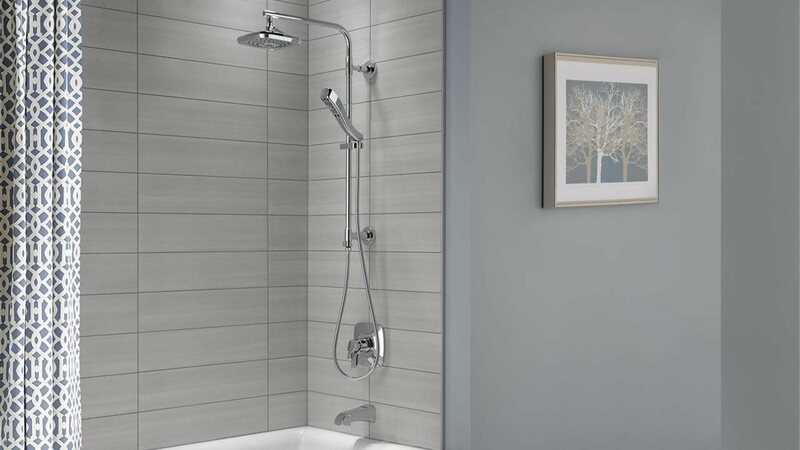 An adjustable hand shower on the column allows the added benefit of a slide bar and overhead shower in one. In modern design, creating a contemporary space is about more than just how the room looks. When homeowners were asked to share the most important characteristic of their design purchases, the scent of the home ranked among the top five qualities from responses in the bi-annual Delta Faucet Homeowner Index. To truly complete the modern look and feel of your bathroom, skip the traditional candle and consider adding elements such as an aromatherapy diffuser to customize your space with different scent combinations. For more design inspiration, visit DeltaFaucet.com/InspiredLiving. This article is available to download for free use in print and online publications. If you must edit the article, please include at least one brand reference. All articles must retain the (BPT) or Brandpoint byline. A secluded bathroom is an ideal spot to experiment with modern designs without undergoing a major renovation. Below are a few tips to add contemporary elements. Accessorize simply: Choose simple and polished accessories that complement the aesthetic of the room. Incorporate sleek, angular towel bars or an elegant robe hook. Add warmth: Incorporating softer materials such as a plush rug, textured bath towels or handwoven wicker baskets, will provide contrast to angular accents, bringing a sense of warmth and tranquility. Create a timeless aesthetic: Inspired by the modern styles found throughout European homes, the Delta Emerge Shower Column couples bold lines with impactful design to deliver a luxurious, customizable shower experience. Engage your senses: To truly complete the modern look and feel of your bathroom, skip the traditional candle and consider adding elements such as an aromatherapy diffuser. © 2016 Brandpoint - All Rights Reserved.